One of the most important painters of depression-era America, John Steuart Curry was born near Dunavant, Kansas in 1897 and spent his early years on a farm. Curry began his formal training at the Kansas City Art Institute, moved to the Art Institute of Chicago in 1916, and in 1918-1919 attended Geneva College in Pennsylvania. He worked for several years as an illustrator, but went to Paris for a year in 1926, where his encounter with European Modernism seemed to merely fuel his resolve to paint American subjects in a realist manner. Upon his return to the U.S., Curry settled for a short while in Westport, Connecticut before moving to New York City, where he taught at the Art Student’s League and Cooper Union. Although Curry spent much of his adult life in the East, he remained a child of the Midwest, and his work is in some degree a paean to the hard work, fortitude, and perseverance of those living there. With Gertrude Vanderbilt Whitney’s purchase of “Baptism in Kansas,” painted in 1928, Curry’s reputation began its ascent. In 1934, Curry returned to Westport and married his second wife, Kathleen Shepard. He began to receive important commissions, and the U.S. government selected him to paint murals for the Department of Justice and the Department of the Interior. 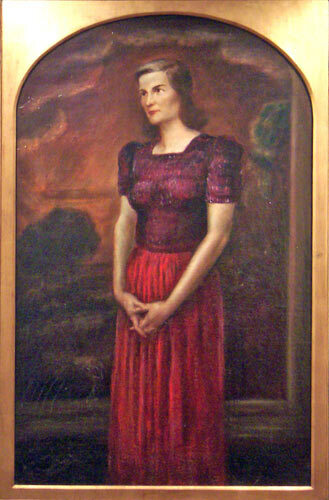 In 1936, Curry was appointed artist-in-residence at the University of Wisconsin, and, in 1937, a movement began to commission Curry to paint murals for the Kansas statehouse. Completed in 1942, these murals remain an enduring tribute to his art. Today, Curry, together with Grant Wood and Thomas Hart Benton, are regarded the central figures in the Regionalist (a.k.a. American Scene) movement. Curry’s work can be found in most of America’s most prestigious collections, including the Art Institute of Chicago, the Butler Institute of Art, the Joslyn Museum (Omaha), the Metropolitan Museum, the Museum of Fine Arts, Boston, the National Gallery, the National Portrait Gallery, the Philadelphia Museum, and the Whitney Museum of American Art.